Tomorrow, April 21, is the birthday of John Muir, considered by many to be a patron saint of the environmental movement. 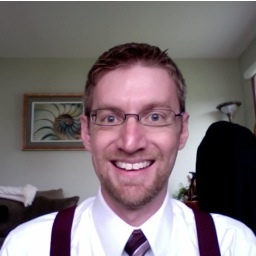 An earlier for of this essay was published at Neo-Paganism.com. John Muir is one of the patron saints of the environmental movement. He was an early conservationist and the founder of the Sierra Club. He wrote extensively about his exploration of the Sierra Nevada mountains of California, merging his inspiring personal experience of the sublimity of the natural world with a call for direct action to preserve wild nature. His activism helped to preserve Yosemite Valley and other wilderness areas as national parks. Muir was raised by a Presbyterian minister and by the age of 11 he was able to recite most of the Bible by heart. He cut short a career in industry following an accident that left him temporarily blinded. He then walked 1000 miles from Indiana to Florida, and from there sailed to San Francisco in 1869. He then walked to the Sierra Nevada mountains where what he saw changed his life. From the summit of the Pacheco Pass, Muir looked down into the Central Valley and saw what he called the “Range of Light”. 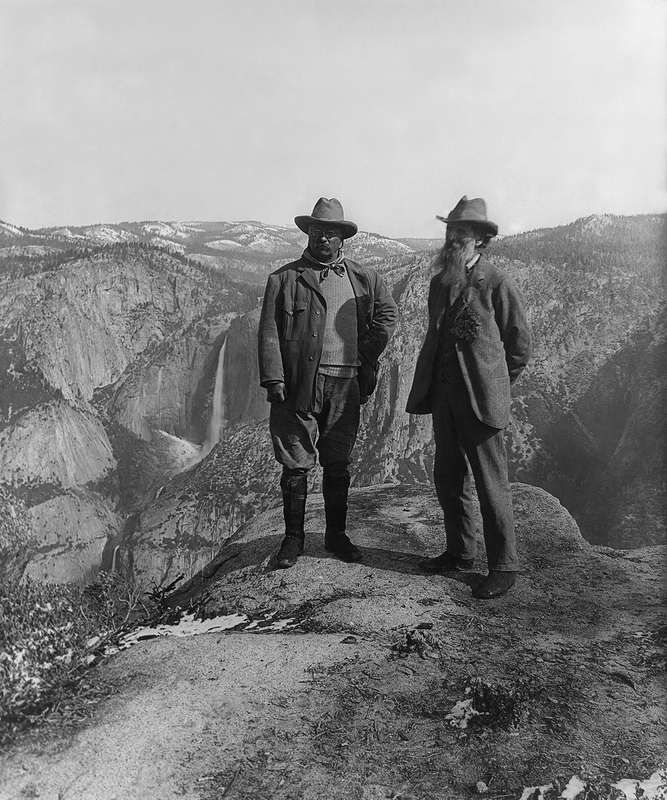 In 1903, President Theodore Roosevelt accompanied Muir on a visit to Yosemite. Roosevelt left his presidential entourage and set off with Muir and a guide into the back country where they camped and talked late into the night. 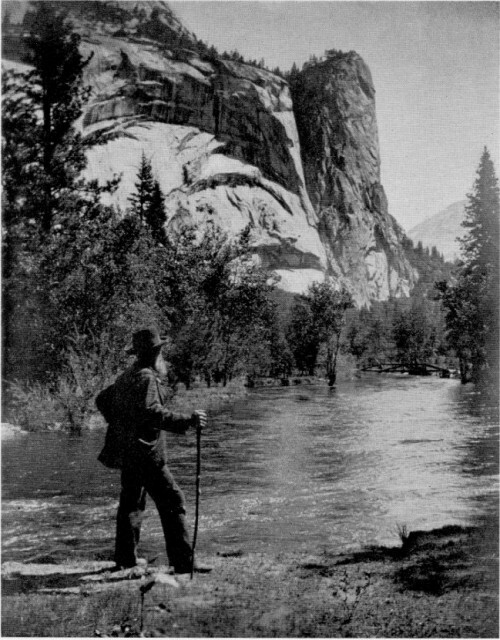 Muir convinced Roosevelt that the best way to protect Yosemite Valley was through federal management. Muir’s description of his interactions with “plant people” and “winged people” (i.e., birds) anticipated the terminology of later neo-animists. Muir distinguished between utilitarian conservation of the forest as a commercial resource, and preservation of the forest for its own intrinsic spiritual value, anticipating what came to be called “deep ecology”. Like the Transcendentalists, Muir saw wilderness as an antidote to civilization, which breeds the wild inner nature out of humankind. He called the mountains his true “home” and described nature as both healing and spiritually nourishing. Muir discovered that direct experience of nature reveals the ecological interconnectedness of all things, a common Neo-Pagan theme. This is expressed in one of his most famous aphorisms: “When we try to pick out anything by itself, we find it hitched to everything else in the universe.” In a late journal entry in 1913, Muir denied that his life was an abjuration of the world: “I only went out for a walk, and finally concluded to stay out till sundown, for going out, I found, was really going in.” This experience of interconnectedness creates an attitude of humility and reverence toward the natural world, which motivated Muir’s political activism. Neo-Pagans today are indebted to John Muir, both for his environmental activism and for his religious vision of nature as a temple of the divine. I feel a personal debt to Muir as well. A few years ago, I visited San Francisco for a business trip and took time out to visit Muir Woods National Monument across the Bay for the first time. The Monument is actually not one of the areas that Muir sought federal protection for. Instead, it was donated by William and Elizabeth Kent and declared a National Monument by Teddy Roosevelt in 1908. The Kents insisted that the Monument be named after Muir (who was still alive at the time). This seems appropriate because of the special love Muir had for trees. The “Monument” is actually small park in a valley of giant redwoods. The “Cathedral Grove” is a specially designated part of the park where signs direct visitors to speak in hushed tones. The Cathedral Grove is aptly named. It truly feels like a holy place. The trees draw one’s gaze upward in much the same way the architecture of a cathedral does. But rather than a cathedral of stone, it is a cathedral of living beings. Some of these living beings are over 1000 years old and are over 250 feet tall. 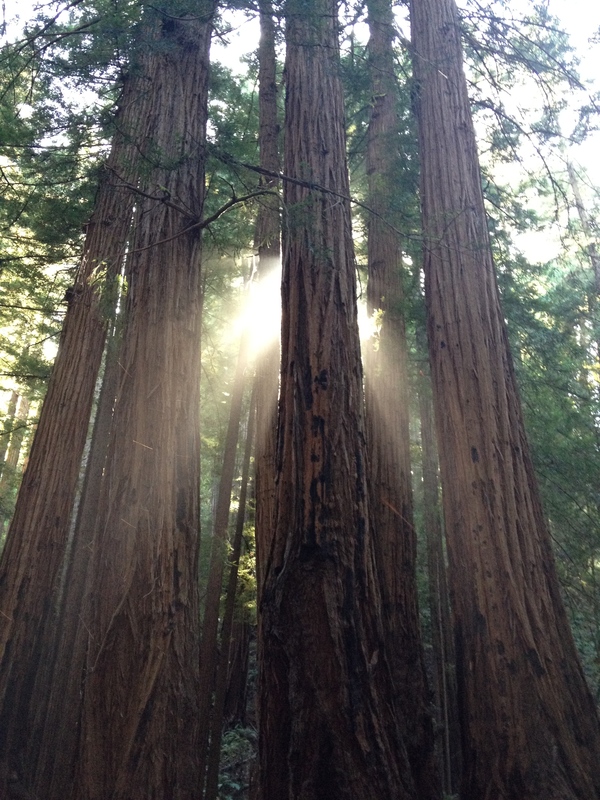 The air IN Muir Woods seems cleaner (and probably is), more alive. I felt like I was breathing in rhythm with the vast beings around me. As I climbed out of the valley on one of the trails and stopped to catch my breath, I was overwhelmed with a feeling of sublime amazement. (I call it my “double rainbow moment”, because I tried to capture it on my iPhone.) In Muir’s words, I found myself, “panting in the whole-souled exercise, and rejoicing in the deep, long-drawn breaths of pure wildness.” I’ve returned to Muir Woods several times since, including with my wife, and the feeling of intense vitality is always the same. Later, I became acquainted with Muir’s writings, which struck a deep chord within me. I recognized my own experience in Muir Woods in his descriptions of his journeys in the Sierras. And this caused me to take a critical look at my religious practice. When I first came to Neo-Paganism, I was mostly interested in a Self-centric form of Paganism, one that is focused on psychological integration and self-realization. Over time though, experiences like the one I had in Muir Woods caused me to question whether my religion was too inwardly focused. Like Muir, I discovered that “going out” was really “going in”. Since then I have tried to integrate the Self-centric and earth-centric aspects of my Pagan practice. Muir’s own passion for preserving wild spaces later inspired me to become more active in climate change activism and to call for a Pagan Community Statement on the Environment, a call which was taken up dozens of dedicated Pagans who have worked to draft the Statement over the past 6 months. After a period of public comment which concludes this week, the Statement will be published on Earth Day. I am proud to have been a part of this project, and I would like to dedicate my own labors on the Statement to the memory of John Muir, the Prophet of the Wilderness.